The U.S. OSHA Hazardous Waste Operations and Emergency Response, HAZWOPER regulation, 29 CFR 1910.120, regulates the safety and health of the employees involved in clean-up operations at uncontrolled hazardous waste sites, employees engaged in certain hazardous waste sites, employees engaged in certain hazardous waste treatment, storage, and disposal (TSD) operations, and in any emergency response activities involving hazardous substances. In short, HAZWOPER applies to hazardous waste facilities. The HAZWOPER regulation became effective on March 6, 1990. Emergency response operations for releases of, or substantial threats of release of, hazardous substances regardless of the location of the hazard. HAZWOPER has a number of important training requirements. These typically involve a required training course that may last from 4 to 40 hours depending on your role and the hazards your are dealing with. There is also an annual refresher training requirement. 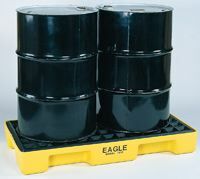 Safety signs, waste handling spill kits and more are available at Safety Emporium. "OSHA HAZWOPER 40-Hour Training Course Manual", Paperback, 2004, 275 pages. Estimated price $135.00. Info and/or order. "Health and Safety at Hazardous Waste Sites: An Investigator's and Remediator's Guide to Hazwoper", Paperback, 624 pages, 1997. Estimated price $204.00. Info and/or order. "Hazardous Waste Management: An Introduction", Hardcover, 300 pages, 2011. Estimated price $39.70. Info and/or order. "The Complete Guide to Hazardous Waste Regulations: RCRA, TSCA, HTMA, EPCRA, and Superfund, 3rd Edition", hardcover, 560 pages, 1999. Estimated price $159.93. Info and/or order. When facilities are requested to submit an MSDS or Tier II form by the SERC, LEPC or fire department (the minimum "threshold" for reporting in response to requests is zero; i.e., anytime the SERC or LEPC or fire department makes a request). Likewise, an employer at a hazardous waste facility may use MSDS's (or other information) to determine the level of protection that is appropriate for hazardous substances as well as health hazards when there is no permissible exposure limit or published exposure limit. Remember that MSDS's are not required for hazardous waste according to 29 CFR 1910.1200(b)(6)(i). OSHA has a HAZWOPER FAQ. View Official OSHA letters of Interpretation containing answers to the most common questions about HAZWOPER. The Official OSHA inspection procedures for HAZWOPER (the guidelines OSHA inspectors use!). Evaluating HAZWOPER Training Requirements at ChemicalProcessing.com. Hazardous Waste Labels are available at Safety Emporium. See also: CERCLA, EPCRA, RCRA, TRI.